In an effort to make Andhra Pradesh a solar-panel manufacturing hub in the country, the Government of Andhra Pradesh has inked an Memorandum of Understanding (MoU) with China’s XI’AN LONGi Silicon Materials Corp for setting up of a solar module and cell manufacturing plant in Andhra Pradesh. The Memorandum of Understanding (MoU) was signed on Wednesday late evening in New Delhi by the LONGi’s Chairman Baoshen Zhong and Principal Secretary (Energy, Infrastructure and Investment), Government of Andhra Pradesh Ajay Jain, in presence of Chief Minister N. Chandrababu Naidu. Another MoU was signed between Sri City (P) Ltd and XI’AN LONGi Silicon Materials Corp, later. XI’AN LONGi Silicon Materials Corp is amongst the top 5 global silicon wafer producers with four production bases in China and 3 GW of wafer capacity. 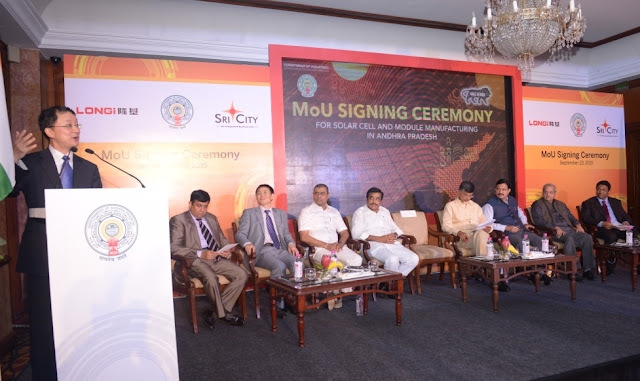 The Chinese company will invest in a facility for manufacturing solar cells and modules with the capacity of 500 MW at Sri City in Chittoor District of Andhra Pradesh, with an estimated investment of Rs. 1,500 crore. This deal will provide potential employment to 1,000 people. This is one of the major investments from a Chinese company in Andhra Pradesh following the visit of Chief Minister and the delegation from the Government of Andhra Pradesh in April this year. “I want to create a Solar Manufacturing hub in Andhra Pradesh. With the interest in the sector from solar manufacturing companies, I’m hopeful that more than 50% of India’s manufacturing capacity will be set up in AP in the long term. Currently, we share 10% of the country’s target for solar power,” the Chief Minister added. Meanwhile, the Chief Minister also elaborated on the opportunities in the capital city region and how Andhra Pradesh is focusing on creating the best ecosystem for the manufacturing sector.